Today’s gift: My Next Big Thing! Have you ever woken up in the morning feeling unsure of where your day—or your life—is going? You wonder what else might be out there. You think to yourself: What’s next? Welcome to YOUR NEXT BIG THING - a new book and a Blog Hop that will hopefully change your life. 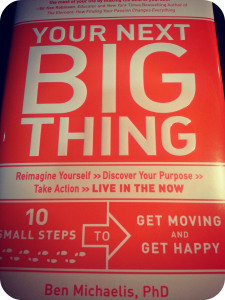 Several bloggers committed to join me to write about the new book YOUR NEXT BIG THING By Dr. Ben Michaelis and how they are each making and sustaining real change in 2013. Commitment is key for making and sustaining real change in your emotional life. Today I am committing to My Next Big Thing: writing and blogging regularly again. In 2010 when I started this blog, I committed to blogging every single day for 365 consecutive days and I did it. I blogged on vacation, on holidays,with sick twins, when traveling. It felt incredible to hit send on Day #365. Sadly, since then, I’m blogging and writing less frequently than I want to and so I want to change that TODAY. Vision: It’s wonderful if you know exactly what you’d like the New You to look like, but it’s not necessary. All that that you need is to be open to imagining yourself and your life as different than they are now. You can explore the particulars along the way. Promise: When you commit to change you implicitly make a promise. The promise is not to your husband, your sister, or even your kids. The promise you make is to yourself. Energy: Energy and work mean purpose. When you truly believe in something, when you are moving with purpose, you are throwing your energy at something you believe in to make a change and to make it the way you want it to be. I know I can make this change with Ben’s help and I invite you back to My So-Called Sensory Life weekly to read my new posts. A Big thank you to Dr. Ben Michaelis for his guidance and inspiration.